Kristin Kostrzewski of the firm dPOP led the design. “What we try to do as designers is to celebrate the branding, but also the culture. We have “ism’s” — core values (innovation is rewarded, execution is worshipped, saying yes before no, eat your own dog food) — that we want to convey and it’s important to see who a company is when entering any space,” Kostrzewski said. Inside the space used for meetings, fundraisers and events, color, pattern and texture pop from every surface, fixture and piece of furniture. From a ceiling that looks like bone structure to the veining in the floor tiles, the space exudes movement and energy. The movement continues on the bar and perimeter countertops of the kitchen where designers chose Vetrazzo’s Ruby Red, which incorporates red, orange and brown pieces of recycled glass in a white cement binder. 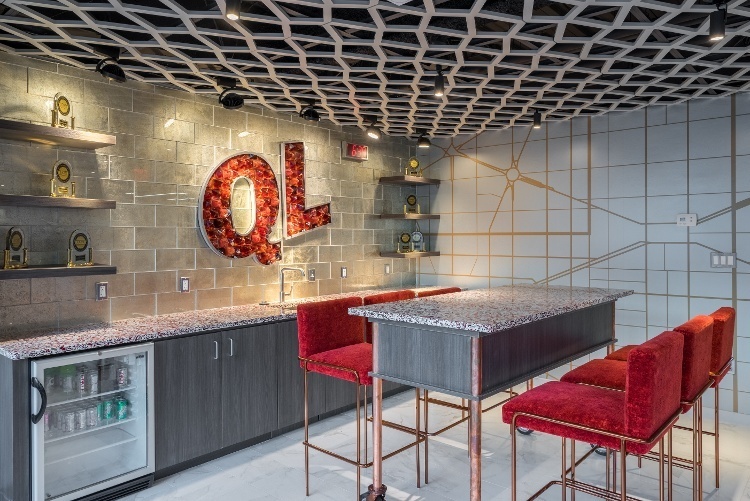 The Quicken Loans project also presented a unique opportunity for the design firm to show off its own sustainable values and design perspective. dPOP is a design agency that grew out of a relationship with Quicken loans and is now a member of the same family of companies. Vetrazzo’s slabs are handcrafted at its own atelier in Tate, Georgia and are hand finished. It takes eight craftsmen a full day to create just one slab. See more on how Vetrazzo slabs are handcrafted here. 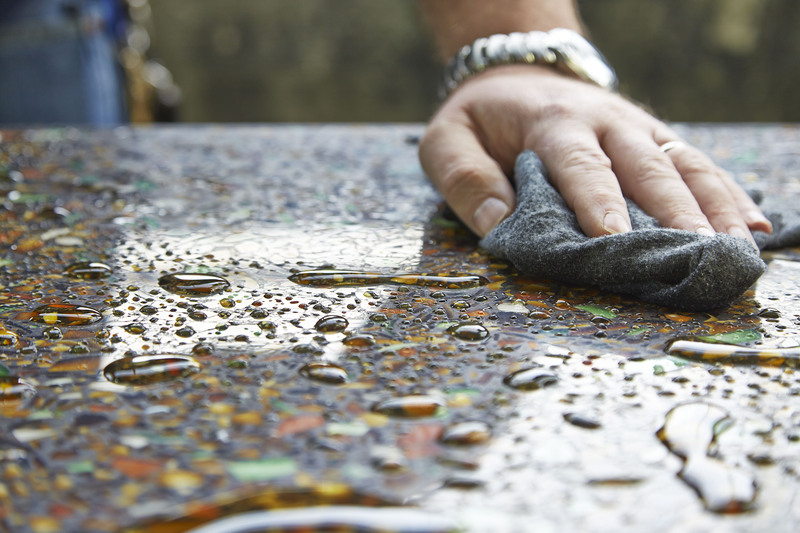 Each slab is made with pre- and post-consumer recycled glass from local curbside recycling programs to reduce its carbon footprint. Old traffic lights, art glass scraps, all kinds of jars, car windshields and architectural glass from skyscrapers are just some of the ever changing sources of Vetrazzo glass. The craftsmen who hand form and finish the surfaces make sure that each slab is unique, even within the same color blend. 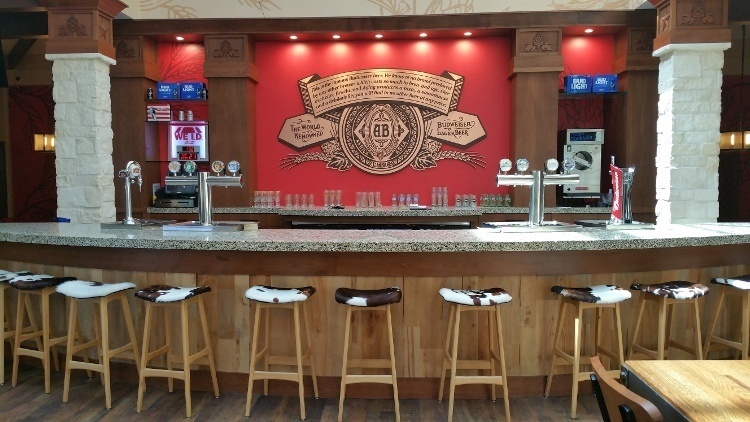 Opened in 1966, Anheuser Busch says The Houston Brewery is one of its greenest breweries. The operation gets some of its energy from landfill gas piped in six miles from nearby McCarty Landfill. On average, the company reports, the brewery sources approximately 30 percent of its energy needs from alternative energy. The brewery’s energy efficiency and conservation efforts also include an on-site bio-energy recovery system (BERS), where brewery wastewater is recycled, adding to water conservation efforts. 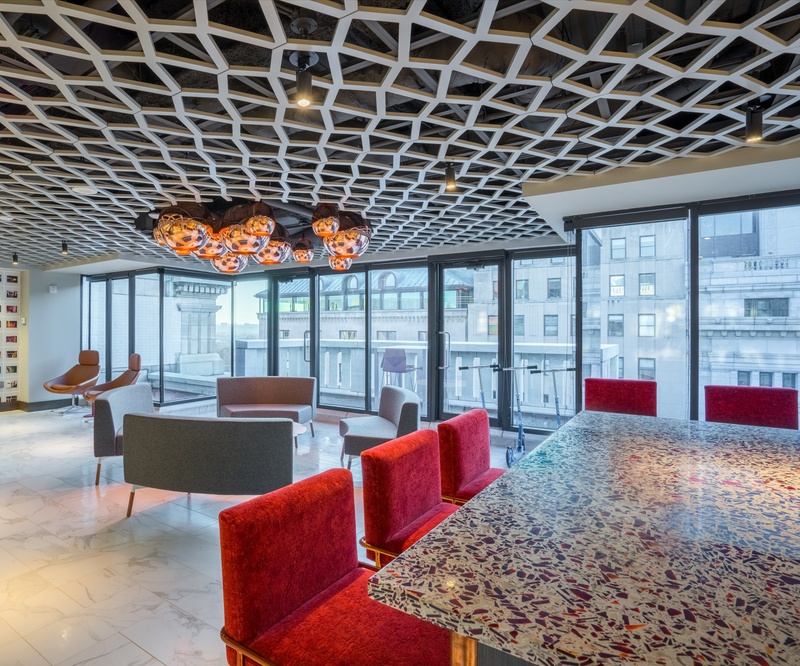 Bo Barkley, owner of Latera Architectural Surfaces, who supplies Vetrazzo to much of the south, finds that the sustainable element of a material is a conversation starter with corporate and residential clients, but it’s not what ultimately leads to material specification. “Sustainability is a small part of the story,” he said. It’s color, more than sustainability that carries a brand’s identity and motivates those who work or do business there. 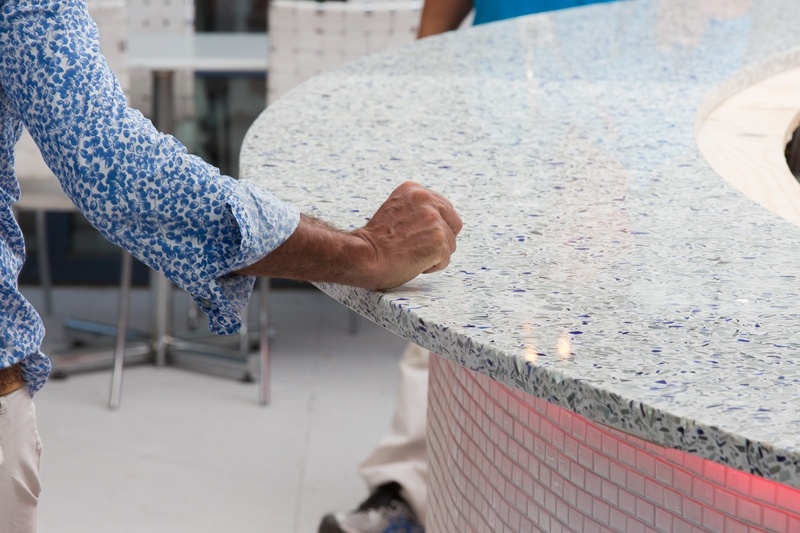 The photo above shows the outdoor bar at the US Open which features the organization's trademark blue in Vetrazzo's Chivalry Blue. “Whether it’s a business or an institutional project, the more times you get that color out there the better. It’s the reason football teams wear the same color shirts. You want uniformity and a strong brand identity. Colors tie so strongly to brand,” he said. For more on blending color, branding and sustainability, download our US Open case study.